"Rent was about market rate, travel expenses OK. Scott is doing a great job!" Trump said on Twitter. 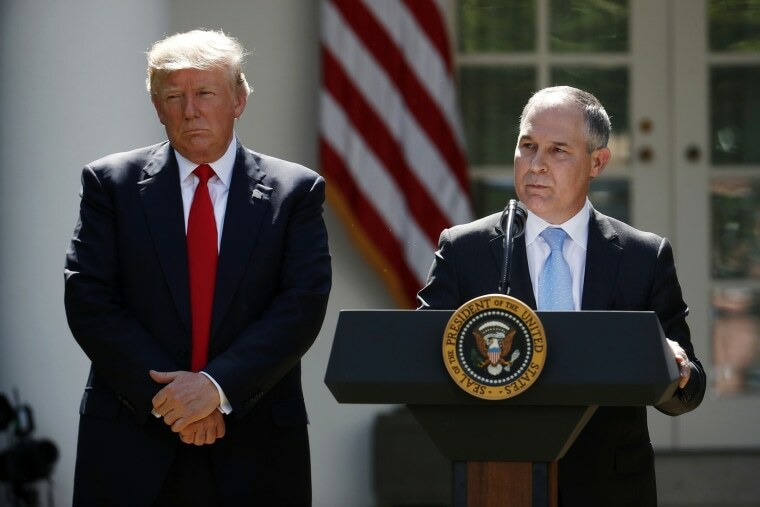 President Donald Trump on Saturday acknowledged that security costs for EPA head Scott Pruitt has been "somewhat more" than the past agency administrator, and that he considers Pruitt's travel expenses acceptable. "While Security spending was somewhat more than his predecessor, Scott Pruitt has received death threats because of his bold actions at EPA,” Trump said in a tweet Saturday. "Rent was about market rate, travel expenses OK. Scott is doing a great job!" Trump said on Twitter, following reports that Pruitt leased a Capitol Hill condo tied to a lobbyist for just $50 a night, and of his first-class travel. Questions have also been raised about pay raises reportedly afforded to top aides without White House approval. The Associated Press reported Friday that the Environmental Protection Agency spent millions of dollars for a 20-member full-time security detail that is three times the size of his predecessor’s part-time security contingent. Pruitt and an EPA spokesperson has claimed that he needed the security and to fly first class because of threats and unpleasant interactions with other travelers. Trump in Saturday's tweet echoes that justification. An EPA official the Associated Press said has direct knowledge of Pruitt's security spending told the news agency that total security costs approached $3 million when pay is added to travel expenses. EPA spokesman Jahan Wilcox told the AP late Friday that Pruitt has faced an "unprecedented" amount of death threats against him and his family. "Americans should all agree that members of the President's cabinet should be kept safe from these violent threats," Wilcox said. An EPA lawyer said this week he wasn't given all the facts when he ruled there were no ethics violation in Pruitt's lease of the condo. In a letter dated Wednesday, EPA ethics lawyer Kevin Minoli said on opinion that Pruitt was paying fair-market value was based on the assumption that Pruitt occupied only one bedroom for $50 a night, as outlined in the lease. Media reports later disclosed that Pruitt's college-aged daughter occupied a second bedroom while she interned at the White House last summer. Minoli said he did not consider the value of a second room in his analysis. Pruitt paid about $1,000 a month, less than a third of what other nearby two-bedroom homes list for. Trump has previously defended Pruitt amid the reports of spending. The president said on Twitter Friday that Pruitt “is doing a great job but is TOTALLY under siege?" White House Press Secretary Sarah Huckabee Sanders at a press briefing Friday praised Pruitt but said the administration was "continuing to review any of the concerns that we have." This week when Sanders was when asked if the president was OK with Pruitt's actions and replied: "The president's not." As the head of the EPA, Pruitt is Trump's point man for the administration's plan to roll back environmental regulations — many of which were put in place by the Obama administration and opposed by industry lobbyists — while boosting the continued burning of fossil fuels, which scientists have concluded is the primary cause of climate change. Republican Reps. Carlos Curbelo and Ileana Ros-Lehtinen, both of Florida, said this week that someone other than Pruitt should head the EPA. Curbelo said on Twitter this week that Pruitt’s "corruption scandals are an embarrassment to the Administration, and his conduct is grossly disrespectful to American taxpayers" and that he should either resign or Trump should dismiss him. Ros-Lehtinen said "distractions and scandals" have overtaken Pruitt’s ability to operate effectively and "Another person should fill that role." House Minority Leader Nancy Pelosi, D-Calif., on Friday said in a statement that "Pruitt must resign."